Off-Grid solar systems are fully self sustaining while a hybrid system can still draw from the grid but only when absolutely necessary. An off grid solar power system is a fully self sustaining source of power where connection to the grid is not possible, not financially viable or just because people choose not to. Off grid systems usually have a generator as a back-up source of power if the solar panels are unable to charge the batteries (either because of high loads of demand or continual bad weather not allowing enough charge). A hybrid solar system still has a battery bank and can be self sustaining but with continual bad weather or if peak loads exceed the systems capabilities it will draw the extra necessary power from the grid. There are two main types of off-grid or stand alone solar systems. 1. AC Coupling – this is generally the preferred method for larger stand alone systems where constant, reliable AC power is needed. The majority of larger residential or commercial installs are now like this. The strength of an AC coupled system is that it is very efficient at supplying electricity during the day. 2. DC Coupling – can be used for larger systems but tends not to be these days and is now typically found on smaller systems such as boats and caravans. 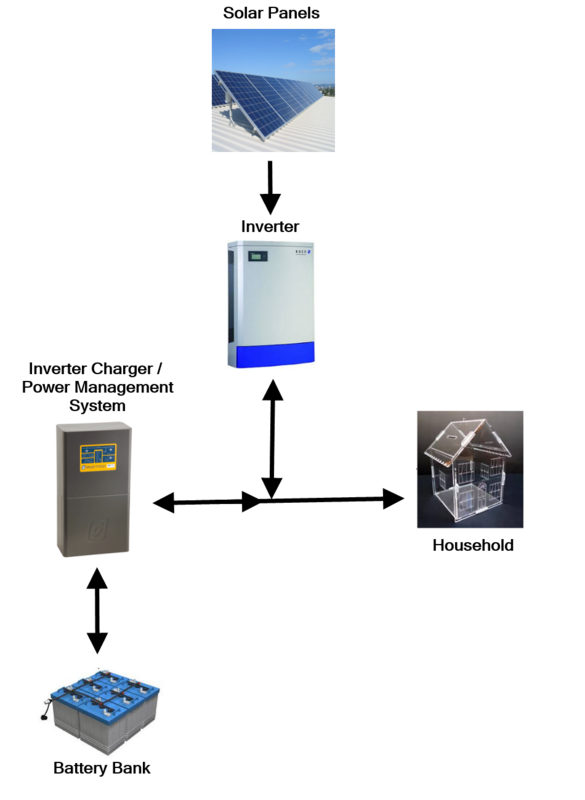 As shown in the picture to the right (click to enlarge) the solar panels will provide power to the solar inverter. Here at Evolution Solar Sunshine Coast we prefer the use of a Selectronic certified inverter like the ABB or Fronius because it is ‘interactive.’ This means it can limit the amount of power that is sent to the batteries, the household or to the grid if applicable. However most inverters will be compatible. The SP Pro is a power management system. This will control the charge sent to the batteries. When there is times of no sunlight and the solar panels are not producing power (i.e. at night) the batteries will power the house. 1. It is important to find out how much energy the household uses – or the household load profile – in order to find out what size solar system and battery back up is needed to run all the appliances etc in the house. 2. The inverter charger needs to be sized to the maximum power peak of the household. In other words, if you run the washing machine, microwave, have the tv on and also boil the kettle at the same time, the inverter charger needs to be able to deliver enough electricity – all at the same time – in order to power those activities. 3. The battery bank is going to be the biggest expense of the whole system and also one of the most important. All of us have most likely had a mobile phone over the years that has a poor battery life – as well as being particularly irritating, this can significantly reduce the effectiveness of the device. In the same way, preserving the battery life is very important in an off grid or hybrid solar system. Sizing the battery bank correctly will ensure good battery life and hassle-free, efficient operation of your system for years to come.